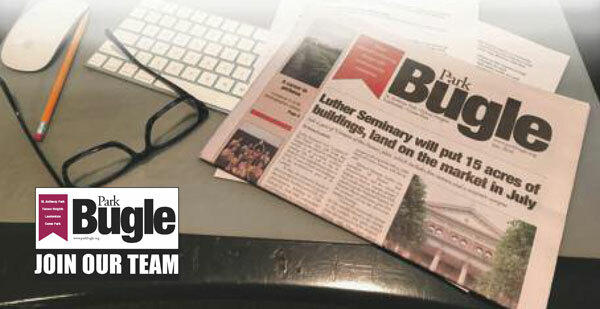 The Park Bugle, an award-winning nonprofit community newspaper, is seeking someone to fill a half-time position as managing editor. The 44-year-old monthly paper serves the St. Paul communities of St. Anthony Park and Como Park and the cities of Falcon Heights and Lauderdale. The managing editor is responsible for planning, editing, producing and publishing the newspaper. As editor, this individual must understand the community to identify the content of the paper and write many of the stories. As managing editor, the position is also responsible for leadership of and working closely with the production manager, administrative support position, advertising representatives, writers, photographers and delivery company. The managing editor also updates the Bugle website and Facebook page. The Bugle is led by a 14-member board of directors elected by the citizens of the communities it serves. Questions should be addressed to Bob Milligan (651-647-0831 or rmilligan@trsmith.com), chair of the personnel committee. To apply, email or send a resume with a cover letter to Bob (1618 Rosehill Circle, Lauderdale, MN 55108). Responsible for planning, editing, producing and publishing the Park Bugle. Attends monthly board meetings and communicates with board members. Develops plan and policies in collaboration with the board. Implements plans and policies for the Park Bugle. Works with the board in hiring and replacing staff members. Provides leadership for the staff including staff meetings. Recruits and supervises writers, photographers, and delivery people. Manages the budget for writers, photographers, and delivery people. Assists the outside accountant as needed to manage Park Bugle finances. Represents the Park Bugle in the community and responds to readers’ concerns. Uploads the contents of each monthly paper onto the website and maintains the Bugle’s website. Works with the production manager on layout, size of each issue, selection of photographs. Bachelor’s degree in journalism, English, communications or related fields. Minimum of 3 years of professional experience in the communications or media fields. Demonstrated excellence in professional writing, editing and proofreading skills. Excellent written and verbal communication skills with ability to work collaboratively with a variety of stakeholders such as newsmakers, freelancers, community members, board members, advertisers, advertising sales representatives and readers. Ability to use good news judgment in the selection and editing of content for the Bugle audience. Ability to direct the work of other writers, editors or freelancers. Ability to project manage the variables of each issue and meet deadlines. Ability to manage monthly budget. Experience in neighborhood or community news settings. Familiarity with the communities that the Bugle serves and the topics and issues of interest to those communities. Familiarity with nonprofit organizations, including fundraising. Familiarity with print production process and graphic design principles. Interest in or familiarity with websites and social media.